I am always adding new links to the site all the time. Keep an eye on this page for updates. British Comedy on American TV is another Benny Hill Fan Site run by John Valdefierro, so feel free to head over and check it out.. There is also a page there for Benny Hill so you can see that as well. Thanks, John. The Benny Hill Show Fan Site is another Benny Hill Fan Site run by Nathan, so feel free to head over and check it out..
Louise Walker was the costume designer for many years on The Benny Hill Show. Today, she runs her own fashion and style business, Charisma Consultants. I recieved an email from Jk Willow, the webmaster of Tommy Cooper, 'Almost A Magician', asking if I'd like to trade links. He passed along a desciption and some background info about Tommy Cooper for me to post here. Tommy Cooper is the funniest magician who ever lived - For over thirty years Tommy was a colossus in the world of comedy entertainment. This is a tribute site to a genius. Thanks to Jk Willow, the webmaster of Tommy Cooper, 'Almost A Magician', for posting a link back to Benny's Place. I received an email from Dave of the Official On The Buses Appreciation Society & Discussion Forums asking if I could place a link to their site from Benny's Place. Reg Varney, who worked with Benny for years, was a cast member of On The Buses. Why not take a stop at The Official On The Buses Appreciation Society and join in the discussion if your a fan. Bettine Le Beau has upadted her web presence with the Official Bettine Le Beau Website. I'm sure Bettine would enjoy you popping over and saying hello. Check out the All-New Leslie Goldie Fan Site! Since these links were originally posted, Cherri Gilham has taken down her blogs. Hopefully, one day, Cherri will post her blogs again. If she does, the links will appear here. If you would like to talk to Former Hill's Angel Penny Kendall you can do so by leaving a message for her in my new ezboard, Benny Hill's Hotel Splendide. You do have to register before you can leave a message or question for Penny there. Hopefully, other Hill's Angels may consent to communicating with fans in this way in the future. Please post appropriate messages only as I will delete anything inappropriate. Penny is gracious enough to take the time to communicate with us, so let's make this fun for everyone! This is also a group where more discussions about Benny Hill and Hill's Angels can take place. Recently I was contacted by the webmistress of www.abusy.com, asking if I would like to add a link to her site from mine. She has already posted a link to Benny's Place in her Benny Hill links section on her site. Check it out! This webspace used to be the Benny Hill Tribute Website. The Benny Hill Tribute Website is no longer online. This new space to Benny seems to be under construction at this time. This site, dedicated to various TV shows, features a page about the Benny Hill Show. The site is in German. Benny Hill on DVD Campaign! I just started this group and I hope many of you will sign up and help Benny Hill and Hill's Angels appear on DVD with remastered picture and sound! As well a DVD without bonus features wouldn't be as fun, so let's see that cast members like Henry McGee, Louise English, Sue Upton, Samantha Spencer-Lane, Clare Smalley and Corinne Rusell get involved in bonuses like Audio Commentaries and a Hill's Angels Documentary! Official Dee Dee Wilde Site! Dee Dee always appreciates letters from fans, but no silly stories or awful jokes, please. You can learn more about Dee Dee at her own official website, www.deedeewilde.citymaker.com. Check it out! At one time, Thomas Amo seemed to be working on a book about Benny Hill. Unfortunately, his website, Kindest Regards, Louise English has been taken down. We hope to hear from you again in the future, Thomas. Unfortunately, this webspace no longer exists. Hopefully one day the webmaster will get it back online. I will certainly update the link if and when it becomes available. I recieved an email requesting a link to a site devoted to the British TV series, Stepto and Son. You can check it out at www.albertandharold.co.uk. This series was the influence for the American Series, Sanford and Son. I recieved an email from Tony James who hosts the Tony James Goldmine Radio Show. Tony is a huge Benny Hill fan and was quite impressed with this site. Do you rememer the fictional town of Melonville and the tiny little TV Station run by Guy Caballero and Edith Prickly? SCTV is now on DVD, but there have been music cuts. You can take part in the SCTV on DVD Campaign and make a difference! pizzabytheslice.com I got the really cool Pop-Up Photo Gallery I have on my site from this site. 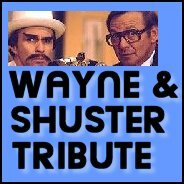 My site dedicated to those Canadian Comedians Johnny Wayne & Frank Shuster.